[Jesus said,] "All authority in heaven and on earth has been given to me. 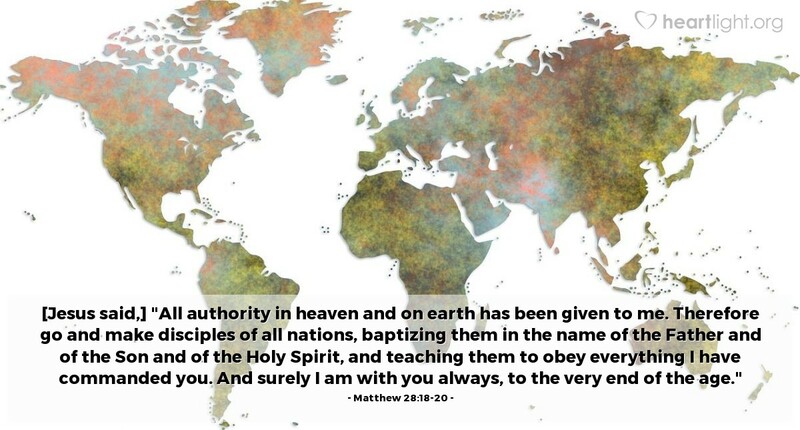 Therefore go and make disciples of all nations, baptizing them in the name of the Father and of the Son and of the Holy Spirit, and teaching them to obey everything I have commanded you. And surely I am with you always, to the very end of the age." Last words! The last words of a parent to a child leaving for college... The last words of a loved one at the bedside of someone dying... The last words of a friend before moving to a distant place... These last words are chosen with care because they leave a lasting impact. Jesus' last words are our marching orders. "Go make disciples of all peoples! To do this," he emphasized, "you must go where they are, baptize them, and then teach them to do what I taught you to do." The words are not hard to understand, so what are we doing about obeying those last commands? Father from whom all peoples derive their hope, use your Spirit to rouse within me a passion to share your grace with others. Nudge me out of my safety zone and call me into your empowering and sacrificial grace so that I can help others come to know you. In the saving name of Jesus I pray. Amen.